Have you heard of the top 10 common misconceptions about British people? Do you have any misconceptions about British people? I know that I do…. 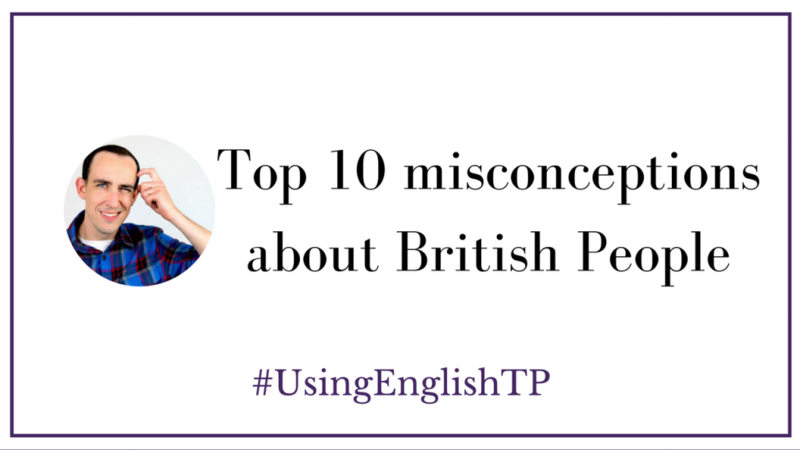 In this #UsingEnglishTP podcast episode, Greg OLA English with Greg to talk about the Top 10 common misconceptions people generally have about British people. It rains all the time in the UK. British people have bacon and eggs for breakfast. Every day. 1. Would you like to visit the UK and why? 2. Have you ever heard of these stereotypes? 1. Yes! I would love to visit the UK. I think the nature is beautiful, each part is special in its own way, Ireland, Scotland, Wales, England… I like the British accent, too! And the UK is full of history. I would love to experience that. Yes, stereotypes exist for many things and also people 😛 Where are you from Ana? thanks for the very insightful post. I would love to visit the UK one day, i am a fan of their accents so would love to here it everyday on the streets. There also seems to be a lot to see and visit as a tourist- one being the London bridge. Thanks Alicia for being here and for your detailed reply 🙂 Wow, the Lond Bridge would be amazing to see! Do you have any plans to visit the UK soon? Do you have any plans to go to the UK anytime soon? Yes, I really like to visit UK, because I love their accent, their culture and all those green landscapes… It has lots of places that I want to see like William Shakespeare’s birthplace, Buckingham Palace, Roman Baths, Stonehenge and many others. about the stereotypes, yes I’ve heard that they drink tea very much, eat bacon and eggs every day, and that they are unfriendly and arrogant and the weather is always rainy. In the end, I wanna thank you for your post, your creativity and the positive energy that you give to us every day. Hey Saeed! I would love to visit these places you have mentioned…. do you have any plans to go to the UK anytime soon? Thanks for your kind words and I am glad my lessons help you! Currently, I don’t have any plans, because I have many other things that I should do first… like completing my master’s thesis, submitting my articles, finding a good university with a good scholarship in Europe and Canada to study Ph.D., saving enough money and so on. I’ve heard that living in UK is really expensive! But still be just a stereotype. So, is it true or not? 1.Yeah, I would like to visit UK. I love trying new staff and know about new cultures. This is Meryam, from Morocco.